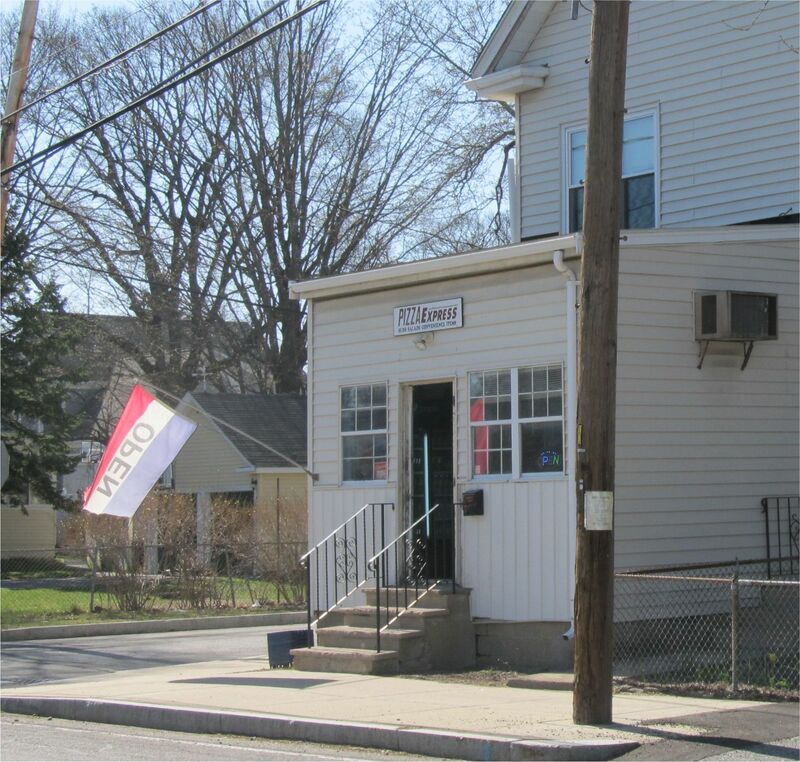 Express Pizza at 65 Loomis Street in the Depot District is now under new management. 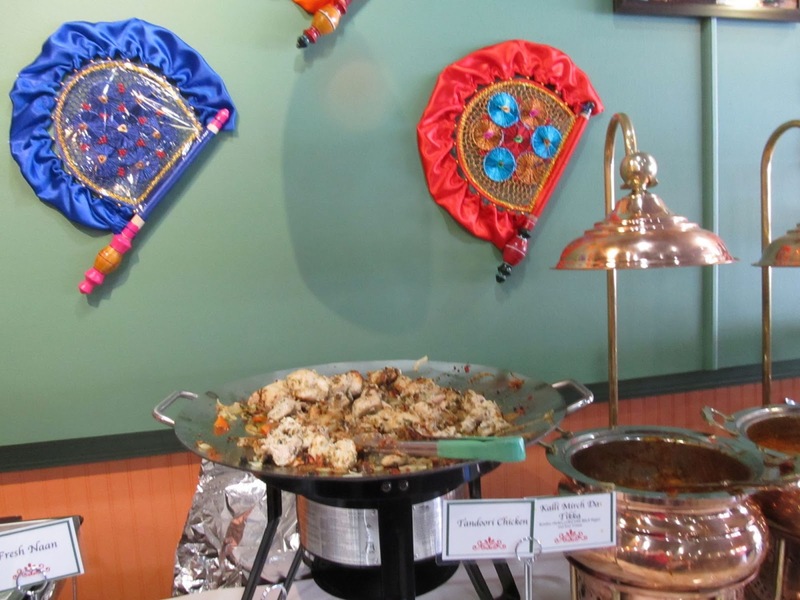 The restaurant which has been open for over 25 years, is now being managed by Laura Hatziandreou, the daughter-in-law of the owners who are retiring. Laura is also the owner of Bedford Cupcakes which had a retail shop for a short time at 119 Great Road. After the shop closed, Laura continued to do catering and sold cupcakes through Express Pizza. 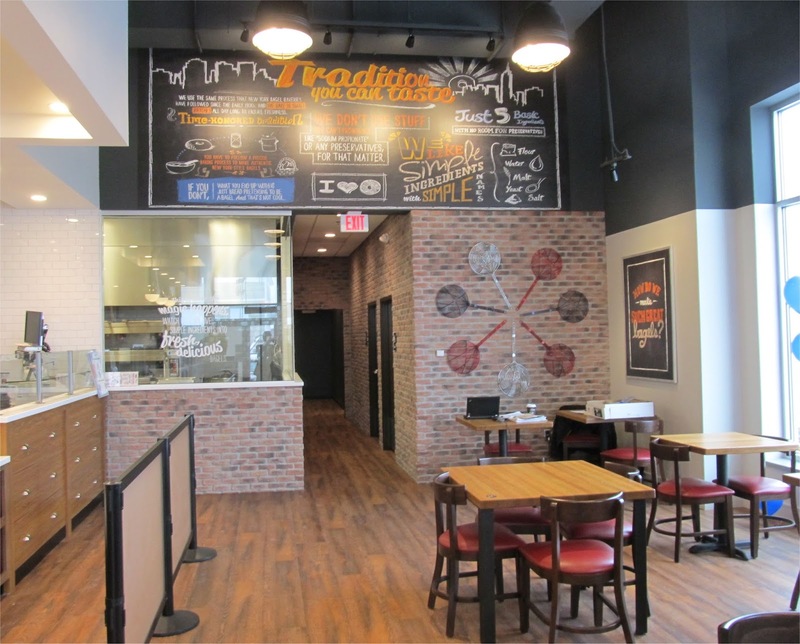 Along with the new management, the menu has expanded to include Gourmet Salads, Sweet Potato Fries, Additional Pizza Toppings and more along with Daily Specials. At the counter, they have also added items such as cookies and chips and have expanded the selection of available beverages. Express Pizza continues to offer free delivery on orders of $10 or more. With the opening of The Crossing at Bedford across the street and new companies moving in on DeAngelo Drive, this seems like a good time to expand the menu and improve the branding. The addition of snacks is also a good one, as nearby residents and workers can now walk to get them versus previously having to most likely drive down to Great Road to grab something. 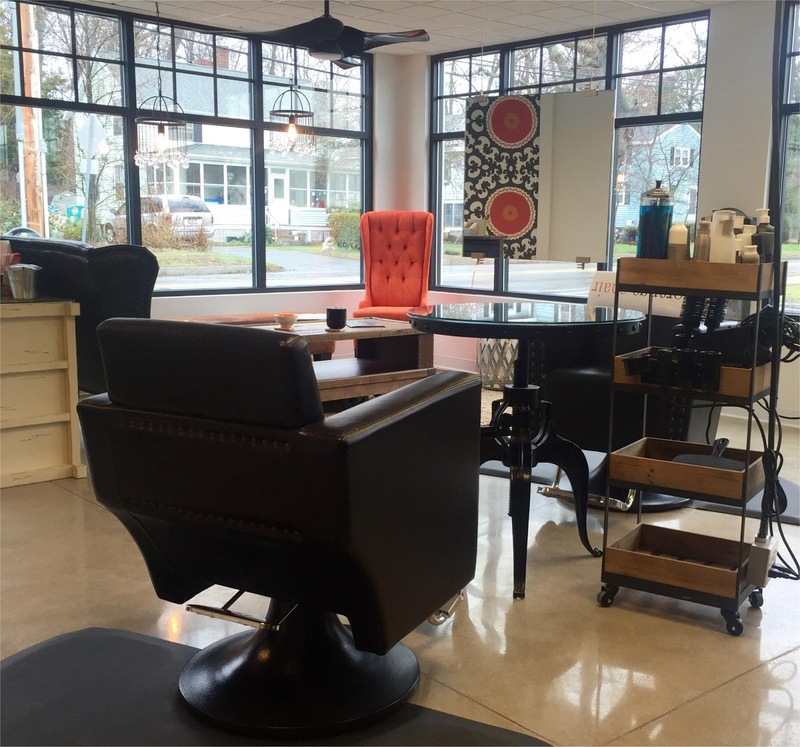 The Orange Chair, which was previously located at 50 Great Road, has relocated to the new Bedford Crossings at 54 Loomis Street in the Depot District. It reopened on April 6th. I recently spoke with the owner Alex Guelli. The Orange Chair opened in it's original location about 2 years ago. Alex had been looking for a new location and when retail space in Bedford Crossing become available, she jumped at the opportunity. of chairs separated by two sided suspended mirrors right in the middle of the room. It's rare you get to build a salon from scratch with new construction. This gave Alex a lot of flexibility in being able to design it exactly as she wanted. Her Father helped with the design. Alex picked out all the furniture. 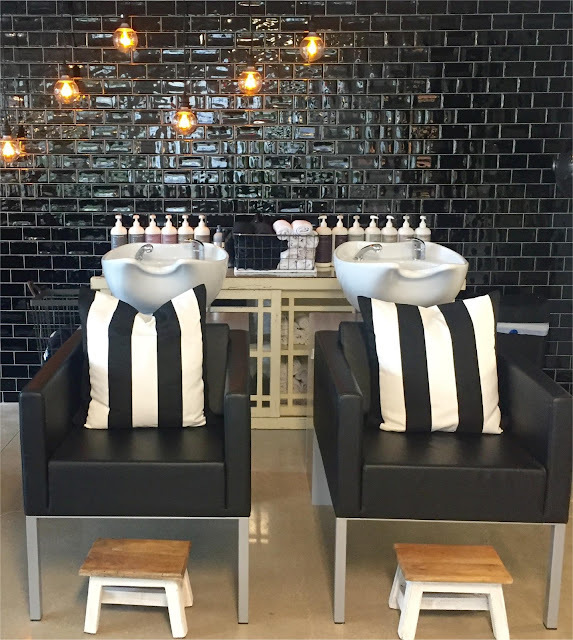 The design is known as French Industrial and gives the salon a very unique look. According to Alex, her clients seem very happy with the design. In fact several of them have asked Alex to help them with the interior design of their houses. Brand new shampoo chairs and bowls. With new construction the Salon was able to set up the plumbing exactly as they wanted it. Alex actually managed to move the salon to the new location without closing. She mentioned it was a lot of work but worth it in the end to ensure she could take care of all her clients. So far her clients seem to love the new space. They feel it's much more open than her original location. 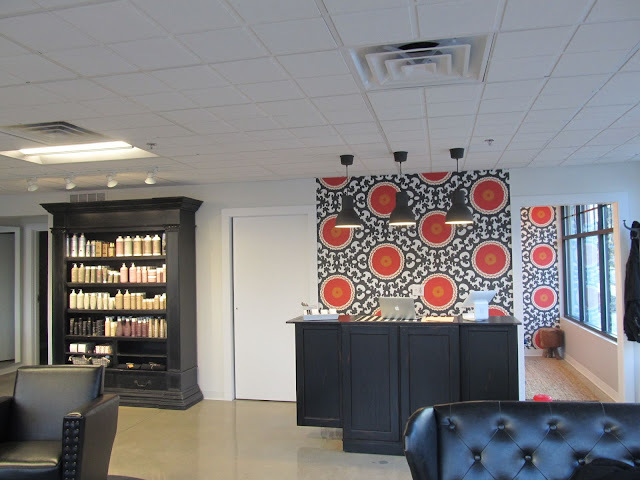 While most of the Salon features all new equipment and furniture, the appointment desk was moved over from the original location. The Salon focuses on hair and makeup. Her clients are split about 75% Women and 25% Men. In addition to her regular salon services, she also sells Living Proof hair products which where created by two professors from MIT. 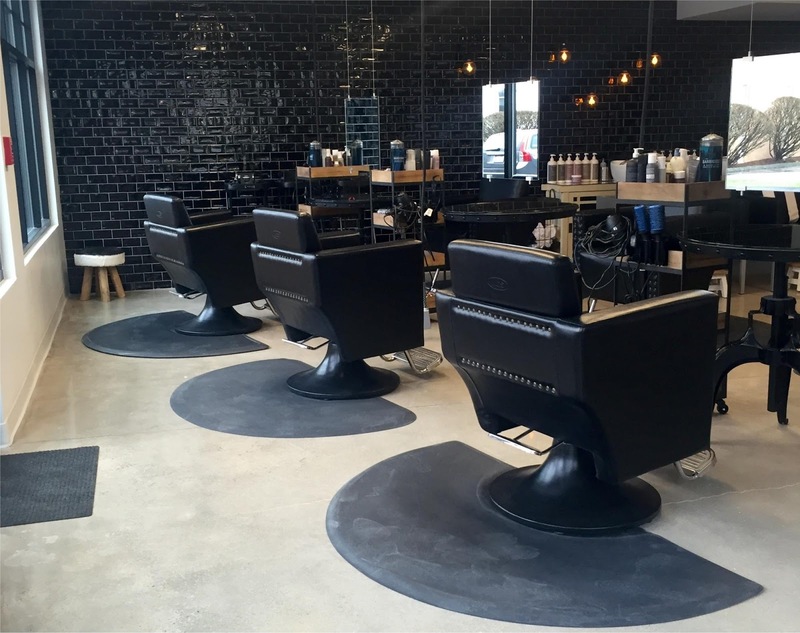 The Salon is open from Tuesday to Saturday during the day and stays open until 8 pm on Tuesdays and Wednesdays. The Salon is expected to have an outdoor sign up in the next month or so. It's interesting that the new retail spaces built at 54 Loomis were purchased by existing local businesses. This seems to indicate a pent up need for newer retail space for local merchants in Bedford. 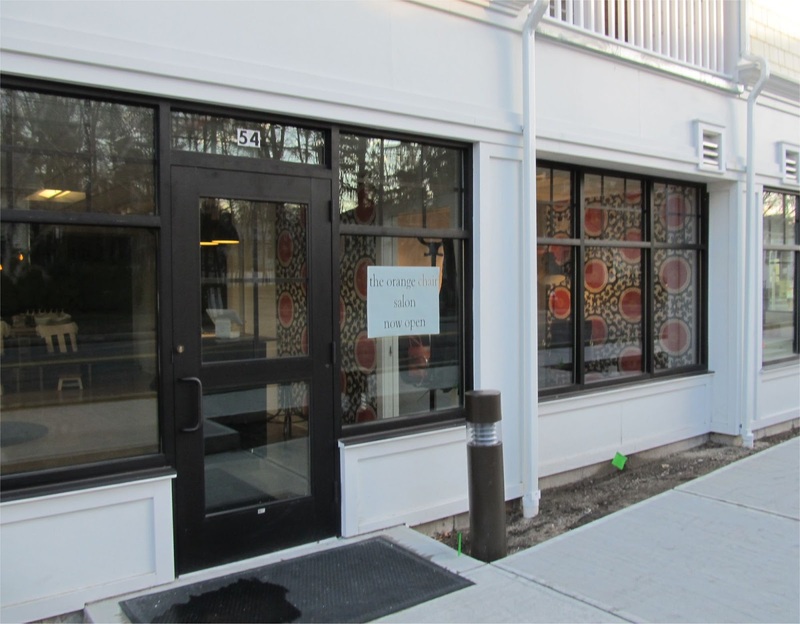 The Body Boutique is now open at 54 Loomis Street. The Boutique had moved out of it's previous location just down the street at 50 Loomis Street in November. The Boutique is now officially open (although it had a soft opening in Mid March). I recently spoke with the owner Katie Gauvin. 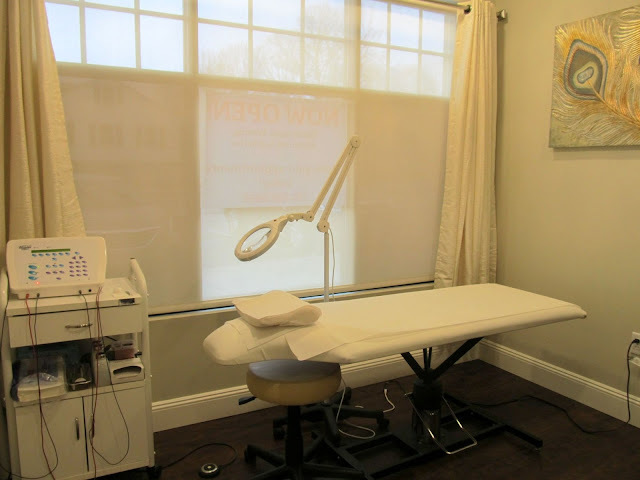 According to Katie, The Boutique offers Electrolysis Hair Removal, Waxing, Facials and other advanced aesthetics such as LED Light Therapy. 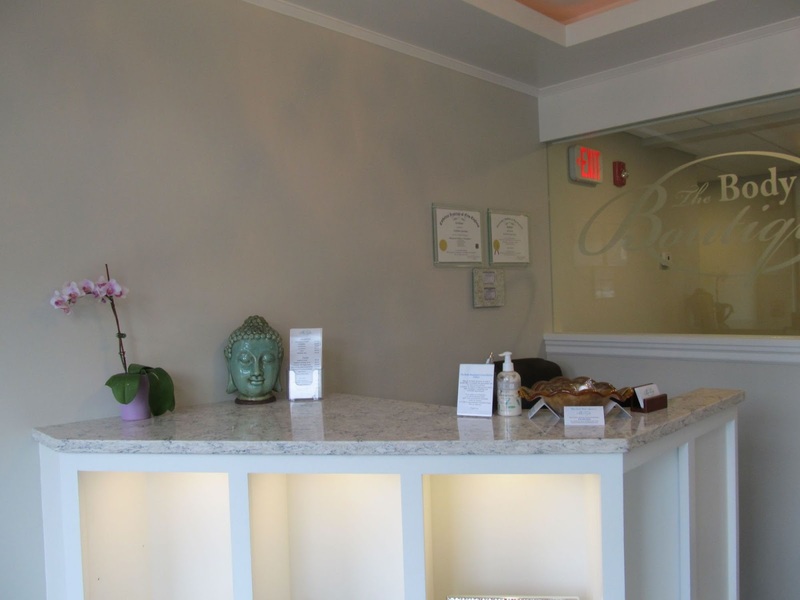 The boutique includes a reception desk and a small waiting area. Katie is a licensed Electrologist and Advanced Aesthetician. She graduated from The Electrology and Aesthetics Institute of New England where she had over 1100 hours of training before she applied for her license. While she was satisfied with her previous place, she really wanted a location that was originally designed for retail. She noticed the construction going on just two buildings down and made some inquiries. The retail space is a little unusual in that it is a condo compared to most retail which tends to be rental. Since it was a new building, the developer provided them with a plain vanilla space. Katie's husband is a contractor and did most of the build out, enabling them to customize it to fit their specific needs. Katie is very pleased with how the new space turned out especially with the amount of natural light that filters in. The Boutique consists of a lobby and three individual treatment rooms. Most treatments take between 15 and 90 minutes. 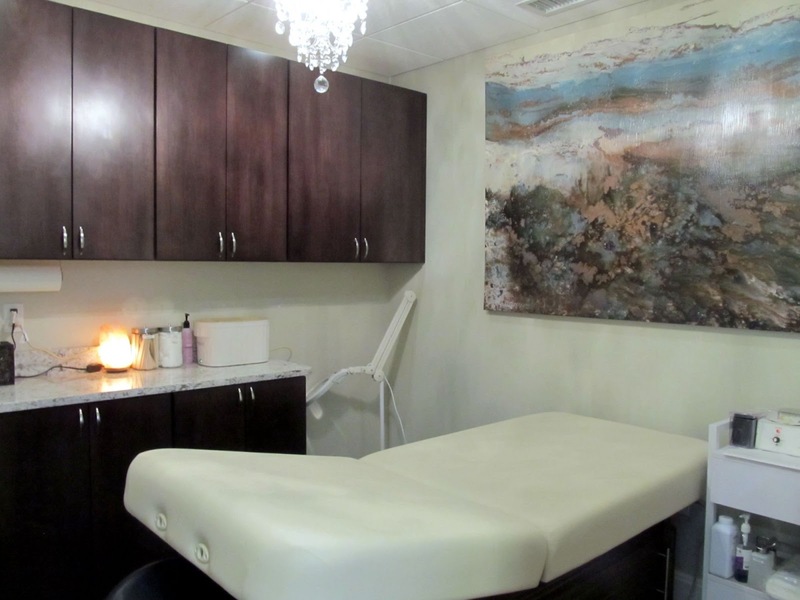 The first treatment room is dedicated for Electrolysis. With two Salons next door (The Orange Chair which just opened, and Colasante Hair Salon), Katie thought it made sense to cross promote with them since they offer complementary services. She ends up referring some of her customers to the Salons (in fact she gets her own hair cut at The Orange Chair) and the Salons appear to do the same for her. Her boutique primarily caters to Women but does get a few male clients. 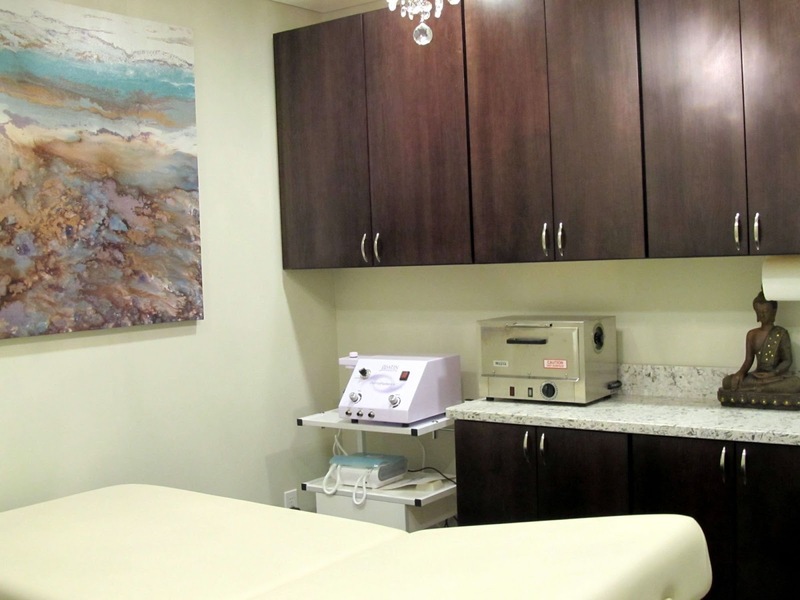 The second treatment room is primarily for Advanced Aesthetics such as Chemical Peels, Micro Abrasions and Facials. Katie see's the Depot District as an up and coming area in Bedford with lots of new stores and increasing amounts of foot traffic. The third treatment room is designed for both Advanced Aesthetics and Electrolysis. Katie has hired an additional Electrologist who will be starting later this month. The current hours of the Boutique are Tuesdays and Thursdays 11am until 8pm, Wednesday 9:30am to 3:30pm, Friday 10am to 5pm and Saturdays are from 9:30am to 3pm. It's good to finally see retail opening up at the The Crossing at Bedford and will provide additional vitality to the Depot District. Seems like smart marketing to cross promote with the existing Salons. The co-branded Bruegger’s Bagels and Jamba Juice Restaurant held it's grand opening on Monday April 4th in Bedford Marketplace at 158K Great Road. 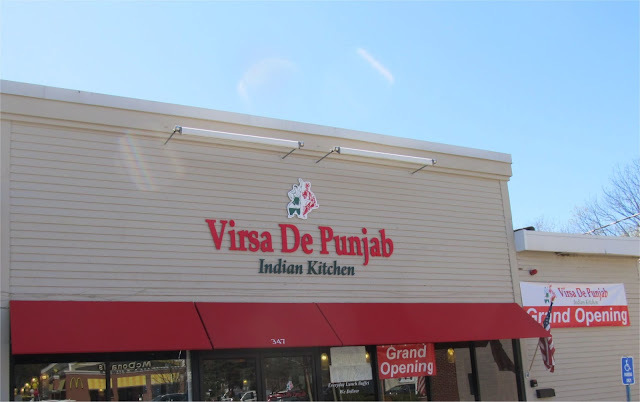 While the restaurant is officially opening on Wednesday April 6th, it's soft opening was on Saturday April 2nd. 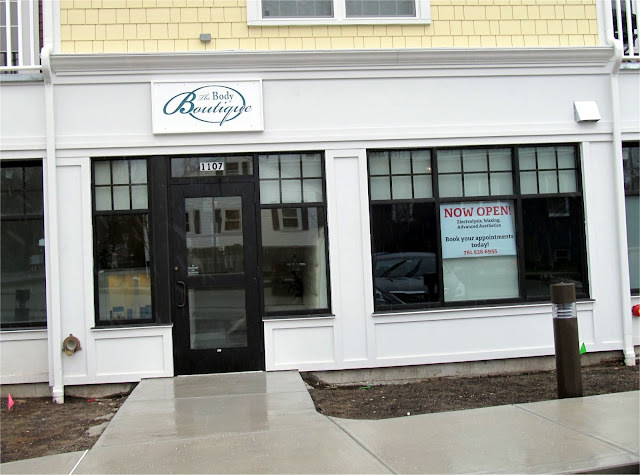 The previously Brugger's location closed last October shortly before it's existing building was demolished as part of the Bedford Marketplace renovation. 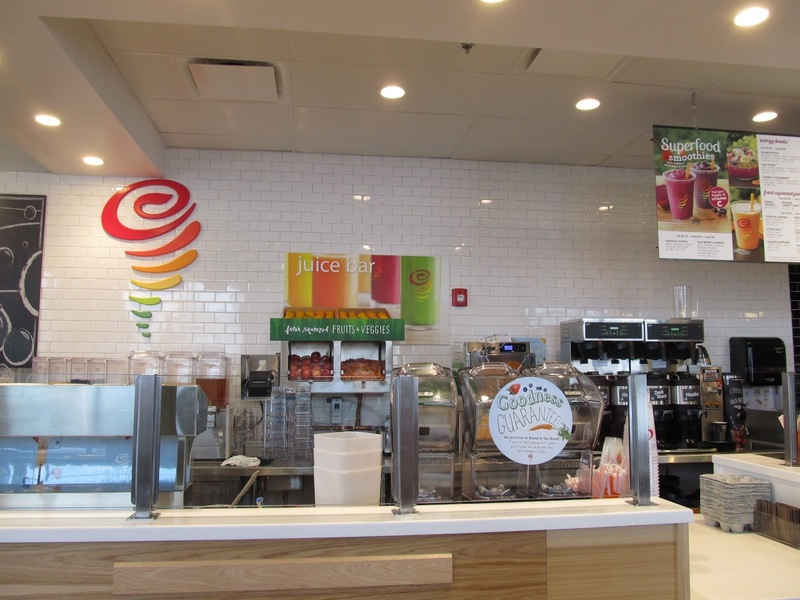 Although there are over 275 Bruegger's Bagels and more than 880 Jamba Juices, this is only the third co-branded location overall and second in Massachusetts (the other co-brand recently opened in Melrose). The new juice bar should drive additional sales throughout the day. 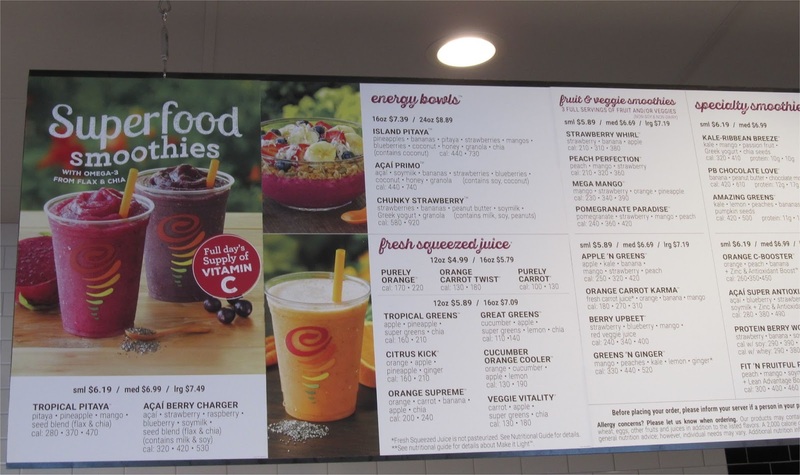 The new co-branded restaurant adds fresh-squeezed juices, signature smoothies and energy bowls from Jamba Juice to go along with the regular Bruegger’s Bagels menu. Furthermore, the new location features several new items such as Cheesecake Brownies and Blueberry Muffins along with additional coffee selections. The new menu offers a wide selection of different juice options. The new space has a wide open feeling with high ceilings that encourages customers to linger. The dining area has a variety of regular tables and high tops. The restaurant is open from 5:30 a.m. to 9 p.m. Monday through Friday and from 6 a.m. to 7 p.m. Saturday and Sunday. 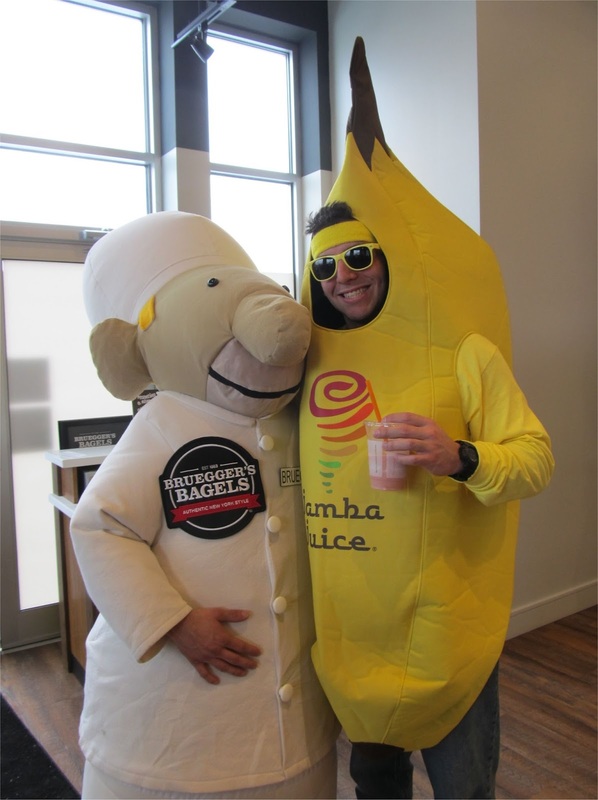 Mascots for both Bruegger's and Jamba Juice were present at the Grand Opening. Co-branded locations can make a lot of sense when the product are complementary and the day parts of sales differ. In this case, it appears to be a good idea. While Bruegger's Bagels has historically done well for Breakfast and Lunch, the addition of Jamba Juice should drive more breakfast sales and really lift afternoon and early evenings store traffic. This is probably the primary reason while the hours have been extended by over 30 hours a week, which should boost revenues and increase profitability. Like b.good, Bruegger's marketed their opening in conjunction with raising funds for the< Bedford Schools on April 2nd and 3rd. In this case, customers got to choose how much they paid for a special menu offering and 100 percent of proceeds were donated to the Schools.